What's Happening in Religious School? Read the monthly newsletter to find out! Scroll down to read news from the teachers. We reviewed the first 7 letters of the Hebrew alphabet and added 1 more playing Aleph Bet Grab Bag. Students took turns reaching into a bag to pick a Hebrew letter. If they could say which letter it was or match it to its poster, they kept the letter, if not, they had to turn it back in. The participation rewards were a grab bag of prizes. 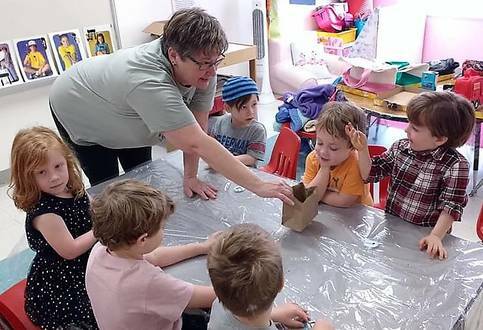 Our Tu B’shevat activities were reading a book, watching the movie The Lorax, a craft activity making a tree out of toilet paper rolls and going outside to make tree bark rubbings. Also, the toys we played with during free time were made out of wood; Lincoln Logs and blocks. For the MLK Day school program the children joined the Kindergarten and First Grade class for the reading of As Good as Anybody: Martin Luther King, Jr., and Abraham Joshua Heschel's Amazing March toward Freedom. The students then did a Praying with Our Feet activity. On a left foot template they put good things about themselves and on the right foot template what good things they do. The gender equality lesson asked the question are “girl toys” and “boy toys”. We learned that we can play with all toys. The Godzilla toys seemed to have the strongest distinction for the students. In the end, everybody played with all the toys. The Kindergarten class has had a productive beginning of the year! 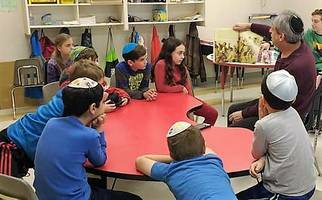 We spent January talking about Tikun Olam (repairing the earth) and how we can help in our own homes to preserve the earth and its animals. We spent a special day Praying with Our feet on Martin Luther King Jr. Day and talked about gender differences. Continuing with our Tikun Olam theme, we went over important words such as "environment" and "recycle," and even made our own tote bags to cut down on plastic! 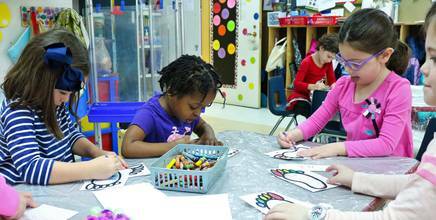 The Kindergarten class is looking forward to a new month of learning, creativity, and fun! First grade has been having a blast since the new year began. We started 2019 by thinking of others. We did a brief unit on tzedakah and each made our own tzedakah boxes so that we can also continue at home what we have been learning and practicing in school. Since then we've been busy learning tfilot/prayers and widening our knowledge of the Hebrew alphabet. We've even had fun practicing making our letters out of play-doh, clay, shaving cream, and pretzels! First grade was also glad to participate in the joint day of learning with Or Atid on which we learned about Dr. Martin Luther King Jr., Rabbi Joshua Abraham Heshel, equality, and how we can make a difference. Hebrew 1 (Harlan Loebman) Students have been making progress on learning not just letters, but they are recognizing some words from prayer as well. Words such as Baruch, Barchu, Shma, Adonai as well as others are being recognized with Increasing ability. We have done this through different games as well as through the book we are using in class. We have covered about half of the book already. 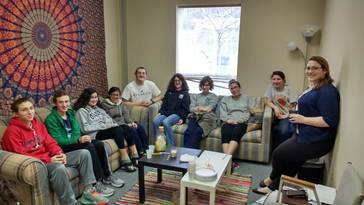 Hebrew 4 (Ronit Saar) Students learned the Hodaha, saying thank you, as part of the smoneh esreh 18. We learned many grammar exceptions of root letters that are not always in the words and the translations. We put a strong emphasis on prefix and suffix learned the ( איתן) the prefix letters of future tense .We finished the 4th chapter in the Hineni. In this chapter we talked about appreciation of everything and everyone around us, about who or what are the rocks in our life and how we can show our gratitude in action. In the month of February we are going to learn the last part of the amida, shalom. Let me know if you have any questions. Our second and third grade Judaics class just finished a unit about stories involving Isaac, and Jacob. In this unit we learned about how Abraham directed a servant to find Isaac a wife. We also learned about tricks being played (and their consequences) in the story of Jacob. The students learned about the contentious relationship Jacob had with Esau and ultimately how Jacob wrestled with his conscience in order to make peace with his brother. A very notable program happened on January 20, the Sunday of MLK weekend. Our programming took a turn to learn about the Jewish connection to the civil rights movement as well as other historic protest movements that helped Tikkun Olam (to repair the world). We learned about protests and marches. Importantly, we as a school brought in between 450 and 500 new pair of socks to be given to homeless throughout Richmond to help others in a time of need. Hebrew 2 (Sharon McCauley) In the month of January, we finished Chapter 2 and 3 in Shalom Uvraha and we started on Chapter 4. We are reviewing the letters and reading words, working on reading fluency and also trying to speak more Hebrew in the classroom. I believe that the students have shown a great improvement from the beginning of the year. It is gratifying to hear from them how much they love to come to our school. I am looking for a good February, hoping to have at list a few sentences to be spoken and remembered. 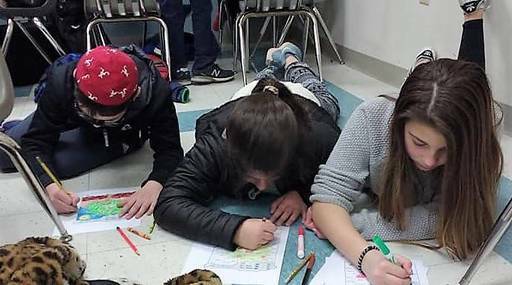 In Judaics, we learn about the state of Israel maps. We concentrated on the journey from Mitzrahim (Egypt) to Har Sinai (Mt. Sinai). We also learned about Moshe Rabeinu (Moses) and the kids made a passport for him. Of course we talked about the Parsha of the week. Soon we will start to learn about Pesach and Jewish Life Cycle. See you next month. In December and January, we continued to dig down into two of the major topics of our year – the Civil War, and the Holocaust itself. With the 6th and 7th grade, we learned about the ways Jewish people came to fight for both sides in the Civil War, and their justifications for what they believed. We also tied in some local history, learning about Judah Benjamin’s role in the Confederate Cabinet, and studied the Jewish recipients of the Medal of Honor during the Civil War. In the 7th grade class, we welcomed several important visitors. 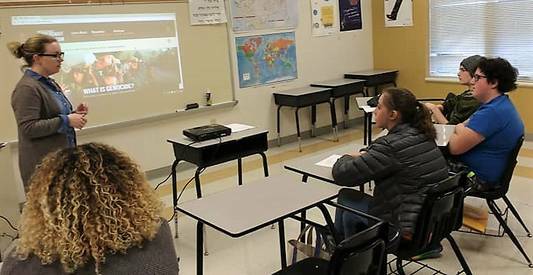 Megan Ferenczy, education director at the Virginia Holocaust Museum, taught the students how to do research on and use reliable sources about the Holocaust. We used that knowledge to being doing research into individual victims of the Holocaust for our Butterfly Memorial Garden project. We also were lucky to have Harlan Loebman come to class and share with us his family’s story from the Holocaust – not just through words, but also through artifacts and documents. We finished January with our most difficult lesson of the year – the Final Solution. This past week in the teen class, our lesson was: Everybody Makes Mistakes – Nobody is Perfect. As a class we discussed our definition of a superhero and how even superheroes tend to be flawed. We discussed what a fatal flaw is in characters we see in movies and literature. We then studied the lives of famous Torah figures and discussed their fatal flaws and how they and others were affected by them. We discussed, in the story of Noah, when G-d chooses Noah to be the father of a new people, Noah says " why me? I am not perfect?" and G-d chooses him anyway, because humanity is not perfect, but Noah strove to be a good person. We then thought about our own flaws and things we are proud of that we do. We ended class discussing how we help ourselves and others grow and to recognize and correct flaws, in practical application. In Youth Group News, our teen board helped to plan and run a great Ruach Pajama Party for the 1st - 5th graders. We had a great time making pillows, having hot chocolate, playing games and decorating cookies. The teens were amazing at making it a fun event for the kids.